The black comes in pink color and the brown comes in blue color! Just can't get enough of this pretty daisy pattern. But why mix blue with that light brown color? Oh well, still very pretty and lovely though! The new one is look more feminine~ I notice the Font is changed too, the old one has a cute ribbon between the Dolly wink type. I can see the new black liquid eyeliner is more darker than the old one ♡. The pigment look better too. 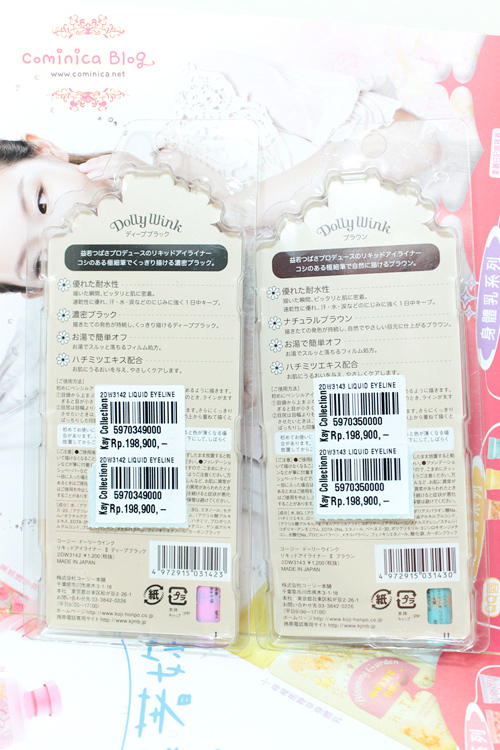 Not sure about the brown one, because this is Dolly wink 1st brown liquid eyeliner. I rub the liquid eyeliner on my hand, really hard. And Of course nothing happened, hahhaha. I already use the Old liquid eyeliner for a long time and it was super good. The new one must be 2 times better than the old one! Jaaan, let's see! I drop some water on it and rub the liquid eyeliner softly. I think the pigment is look quite consistent after I drop some water. But.. after my finger rub.. our finger always warm so the water turned out warm. Look at the brown one! Just imagine when we're sweating, and this is what will left on our eyes. lol TOO BAD the brown liquid eyeliner isn't as good as the black one（￣ー￣）. 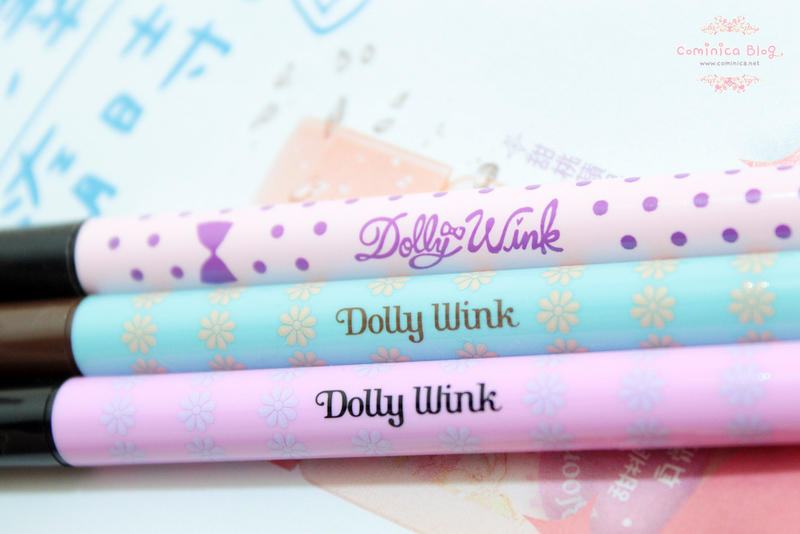 The old dolly wink still better than the Brown, hhahhahaha! I wear the brown liquid eyeliner two days ago and after back to home, it still stayed on my eyes though (except the outer line I drew). Yeah, I admit I wasn't sweating at all that day mwhaahhaha. But my eyes got a little wet because I yawned few times and oily. My eyelid always oily TT___TT hate it! 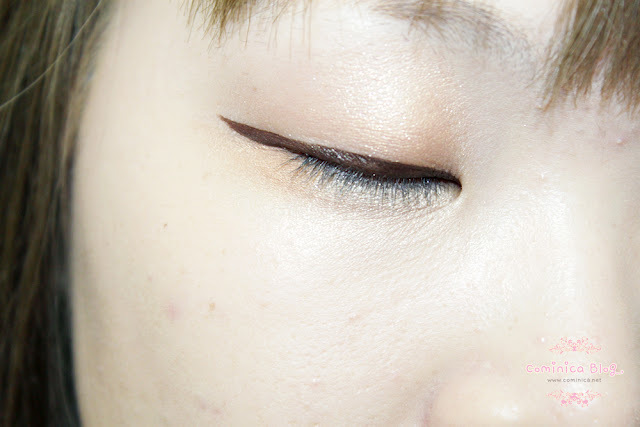 The brown liquid eyeliner, gives my eyes a soft and natural look. Too bad it doesn't stay long like the black one. 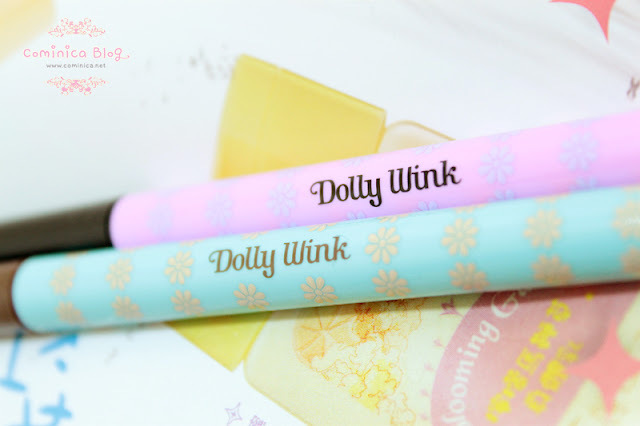 Is the new packaging/formulation dolly wink longer lasting/more waterproof/more smudgeproof than k-palette WP?